Giuseppe Tassini, unlike everyone else in this book, was a real person, a Venetian who lived between 1827 and 1899. So he was nearly forty years old at the time of this story and already very well known in the city. Tassini was the son of a solid middle-class family. His mother was Austrian, his father Venetian. Originally he studied to be a lawyer. But he inherited a fortune large enough to enable him to leave the law and devote himself solely to his passion for Venetian history. He spent the rest of his life burrowing through public and private archives. His most famous book is called Curiosità Veneziane - Curiosities of Venice. It was originally published in 1863, and has always stayed in print. Curiosità Veneziane recounts the stories of the streets and squares, bridges and palaces of Tassini's beloved city, all listed in alphabetical order and meticulously cross-referenced. Tassini's charm and verve as a writer, however, blow the dust off history. The joy of the book is in its anecdotes, like the tale of the time the devil took the shape of a monkey and jumped out of a palace behind San Marco: the angel who marks the hole in the wall, like almost every other Venetian curiosity, is still there to see. This book weaves hauntings, gossip, graffiti and scandal into history. The historian himself was quite a character - a perpetual bachelor (unusual in Italy) and a great gourmand. A sketch of him shows a good-humoured-looking man with a little goatee beard and thick black-rimmed glasses. 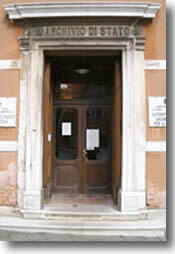 He lived in Calle dei Specchieri (San Marco 635/634). To this day, nearly every Venetian home has a copy of his book on its shelves. Professor Marìn's tall crooked house at Santa Croce 1011. It would be hard to give the house a proper 'street' address as it lurches with contrary leanings between the Calle del Caustico and the Calle Gradisca. Even these two street names divide the house in contrary ways - 'caustico' being a corrosive substance (or something offensive) and 'gradisca' meaning something that pleases. So in effect the professor's home is sandwiched between 'Nice Street' and 'Bitingly Nasty Street'. Small wonder, then, that it lurches. The Gasperin bookshop is in the Calle de Fuseri. 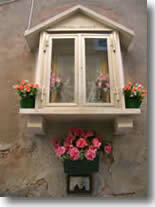 Ambrogio and his family live above the shop. 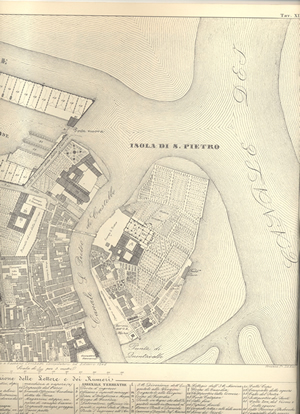 The Ostello delle Gattemiagole, Rio Terra Farsetti, Cannaregio 1839. The Molin family, in the Calle del Teatro, between San Samuele and Santo Stefano. The Antonello family (Renzo from The Undrowned Child) at Corte del Tagliapietra in Santa Croce. Tassini also records a Palazzo Flangini on the Grand Canal, and also a calle and a campiello (a street and a little square) called Flangini, in the San Geremia area of the city. One member of the Flangini family was a war hero in the battles against the Turks. The last of the line was Cardinal Lodovico Flangini, who died in 1804. 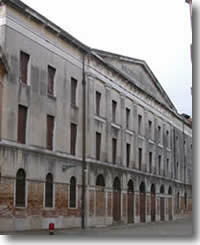 First of all, Tassini's own house, very close to San Marco, in the Calle dei Specchieri. It's a small house, not a palazzo, but it is very close to the Marciana Library, the Doge's Palace and other places where the historian must have done his years of research - and close to many nice restaurants. There's a plaque there to commemorate him. 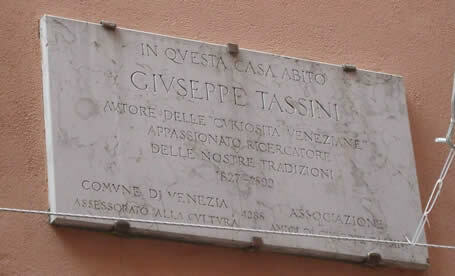 This is a translation: In this house lived Giuseppe Tassini, author of Curiosità Veneziane, passionate researcher of our traditions, 1827-1899. Quintavalle is another kind of Venice, a part of the city where the tourists hardly ever go. It is tucked away, almost hidden behind the great church of San Pietro in Castello. At the time when this book was set, it was a place of apple trees, small houses and a tar factory, as the map shows. The island of Quintavalle is also referred to as the island of San Pietro in Castello, after the church which is its landmark, and was in fact the original cathedral of Venice. The first bishops of Venice had their palace on the island, near the place where my invented tower stands, from the eighth till the fifteenth century. There are also a squero, ponte and fondamenta (a boatyard, a bridge and a street) named Quintavalle. Quintavalle probably takes its name from a noble family who made their home there from around AD430. The Quintavalle coat of arms featured a mountain with six golden peaks and a black eagle against a blue background. The family were members of the Great Council, and some achieved positions of power in the Church. Pietro Marturio Quintavalle was made bishop of Venice in 955. The family died out in Venice in 1328, but some members lived in Crete until 1582. The name Quintavalle seems to have replaced an earlier one, 'Marturio', which means 'martyr'. But there is another theory that the island's name came from the word 'quinavalle', meaning 'there below', referring to the remoteness of Quintavalle from the centre of Venice. And it does still feel remote from the tourist throngs. A map of Quintavalle in 1846 shows the single V-shaped street of this story, with buildings on the south side and orchards on the north. Behind the church of San Pietro was an old cemetery. The main street was - and still is - called the Calle dei Pomeri, Apple Lane. The island today is much more densely populated and there are buildings on the north side of the street too. The military owns part of the island. But there are plenty of kind and chatty old ladies and their cats there still, too. And there are some unusual things ... including a fairytale garden with figures of Snow White and the Seven Dwarves, Pinocchio and other characters. There's also a wonderful decorated window. 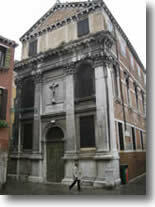 The building belonging to the Scuola del Cristo e della Buona Morte, 'the Company of Christ and of the Good Death', was built in around 1644. 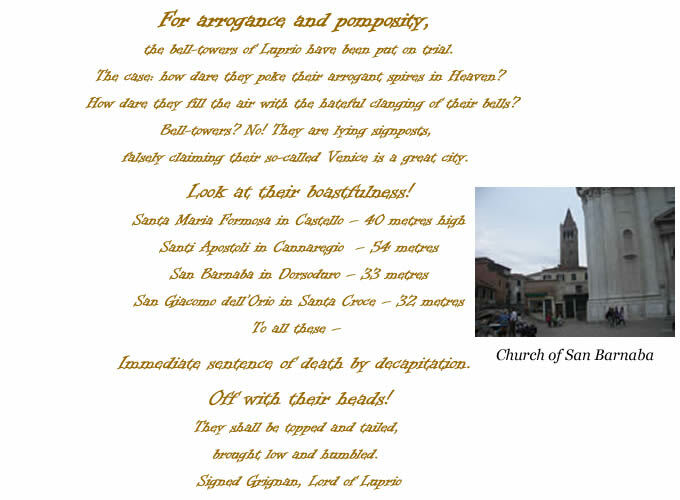 As Giuseppe Tassini tells us in his Curiosità Veneziane, one of the tasks entrusted to this religious and charitable company was that of taking dead bodies out of the water and giving a decent burial to those who could not be identified. 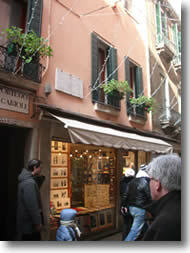 You can still see the beautiful little building, near the vaporetto stop of San Marcuola, at Cannaregio 1750. 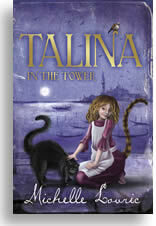 In Talina in the Tower, the evil Grignan becomes stuck to the unusual dome of the Madonna dell'Orto clock tower with Talina's never-setting toffee. The church is in the north of Venice, and its spire looks over both the lagoon and the city. The names of all the sweets came from a lovely little book by A. Jarrin called The Italian Confectioner (1820). Golosi's is the confectionery shop that is most frequently raided by the Ravageurs who are looking for sweets to keep their females full of sugar and therefore a little bit silly. 'Golosi' means 'The Greedy Ones'. Golosi's at Rialto is invented, but it is based on the wonderful old-fashioned confectioner's at Rialto called the Antica Drogheria Mascari in the Calle degli Spezieri (which means 'the Street of the Spice Merchants'). 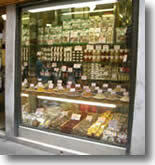 You often see people lingering greedily by the window, sniffing at the spices and herbs piled up in pyramids. Mostarda is still very popular in Venice. It's a thick mustardy chutney often served with cheese or cold meats. It is usually yellow or orange in colour.